The most popular form of entertainment in America in the nineteenth century was far and away the dime museum, an example of an advertisement for one such establishment in Boston appears here. Unlike the theaters and small circuses that had an unsavory reputation, the dime museum was presented as a safe and wholesome refuge where upstanding citizens could learn of the newest scientific discoveries, or partake of the latest and best entertainments. The first grand museum was founded in Philadelphia by painter Charles Wilson Peale. Growing out of the tradition of the wunderkammern (or cabinets of curiosities) so beloved for centuries by eccentric men of means, Peale's Museum featured natural history specimens and his own paintings, which he hoped would serve to educate and uplift the public and in the process earn himself a tidy income to support his growing family. What made the museums so popular was that in a single building - at any time and for a low admission price - anyone could see a host of wonders and amusements, many of an exotic nature, that one would normally have to pay to see individually, or could never hope to come across elsewhere. Here was a sort of nineteenth century one-stop-shopping: pantomine, minstrelsy, waxworks, song and dance, natural history, human oddities and more - all under one roof, and presented in such a way that the patrons felt they were bettering themselves through the experience. For the cost of a few coins, one could travel to far off lands, meet extraordinary people, attend a temperance lecture, feel morally superior to primitive peoples, or just have a jolly good laugh. Truly, there was something to appeal to every interest and sensibility. Although the museums reached the height of their popularity in the late 1800's, dime museums would continue to function in one form or another through the 1940's. Many of the sideshow perfomers who were out on the road from May to September would spend their winters holed up in a museum in some northern city, where they could be assured of a comfortable and warm spot out of the elements but which still allowed them to make a decent living. ALWAYS OPEN DAY AND EVENING. and lead the beholder to doubt whether the figures do not actually live and breathe. Among the figures and groupings arranged to mock reality and creep the living bejeezuz out of visitors was "the celebrated Tableaux of CHRIST'S LAST SUPPER", and similar religious fare catering to the devout, such as a vignette about the prodigal son, the crucifixion, Christ arguing with the doctors ("a characteristic group of seven figures") and something called "The Game of Life", in which a Christian plays chess against Satan. There were waxy displays to appeal to the secular mind as well, including a likeness of "THE SIAMESE TWINS and their beautiful American wives" (the writer must never have seen the Yeates sisters! ), and nine figures representing "the MASSACRE BY PIRATES of the passengers of a merchantman in the India Seas." Abolitionists, who had money to spend like everyone else, could enjoy a display entitled "HORROR OF SLAVERY, as exemplified by seven figures, being actual likenesses of a slave-owner, a slave-driver, and their victims." Surely, an enlightened exhibition for the era, but racial benevolence extended only just so far, for another waxwork called "MURDER of Miss McCREA by the Indians during the Revolutionary War" alleged to accurately depict "the characteristics of the Red Men." The temperance crowd was courted with three groups of wax statues depicting the evils of strong drink, including a drunkard murdering his wife (they really went in for murder back in the day). Perhaps a bit less interesting were further depictions of a school, a blacksmith shop, and various distinguished people whom I presume to have been neither drunk nor murderous, otherwise they would have been so indicated. Here they were trotting out an old favorite. Barnum and Kimball made a ridiculous amount of money displaying the Fejee Mermaid in the years listed above (see my tribute to this infamous gaff, The Woman with the Fegee Mermaid, here). 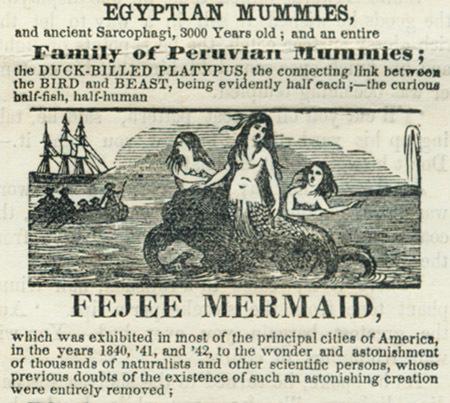 That original mermaid had been leased to Barnum by Moses Kimball, with whom Barnum entered into a partnership to jointly exploit the alleged mermaid. Apparently, this gruesome hoax in which the upper half of a monkey was attached to the lower half of a large fish hadn't lost it's appeal in the several years since its debut and was proving a perennial favorite. Similarly, Barnum's and Kimball's friendship was strong enough to last well into old age. The two remained each other's life-long confidantes and routinely shared money-making schemes and even performers. 25 Cents to the Whole!! If these satements were true, I commend the typesetter for reserving the exclamation points until the very end. This was a remarkable exercise in restraint, for which I am grateful. I don't think I could have stood the strain if they were introduced sooner. Hyperbolic expressions aside, the Boston Museum certainly provided a wealth of entertainment for a paltry admittance price.